Aboard Speedbird, in effect a purpose-built 'large Moth', Hannah will attempting to become the first woman to ever take the sailing speed record above 40 knots. Speedbird is on display at the Science Museum in London from 26-28 May enabling Hannah and her team to give people the opportunity to see the boat and find out more about the technology into her. This comes at a good time of year, with this period coinciding with half term. In order to prepare for this record Hannah has been learning how to sail a Moth, similar in design to Speedbird. Hannah will be training with a number of athletes and professional sailors currently competing on the Extreme Sailing Series, but will also need to drop 4-6 kg and build new muscle groups to have enough strength to sail such a fast boat. She is on a strict regime that includes over 10 sessions a week with around 15 hours of sailing and 8 hours in the gym. Speaking about Project Speedbird, Hannah said: "I knew this was an ambitious project both technologically and physically when we set out to break the women’s speed sailing record. I knew the key to success would be securing the support of partners, like Land Rover, who are world leaders in the innovation and expertise required to streamline Speedbird into a record-breaking machine. “I am enormously grateful for the support of all of our partners as they will give me the competitive edge required to secure and harness the ultimate advantage over the elements to push the boundaries of this project and achieve a world record." After the event at the Science Museum, Hannah will be attempting to make the first crossing of the English Channel in a Moth setting off from Cap de Gris, France to Folkestone, England in early June (depending on weather conditions). 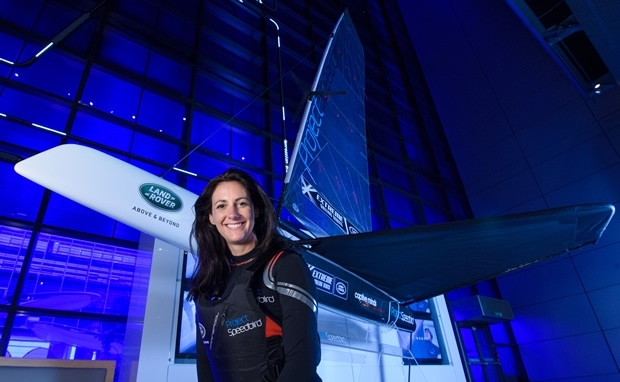 She will then be exhibiting Speedbird in Cardiff at the Extreme Sailing Series presented by Land Rover over 19-21 June.